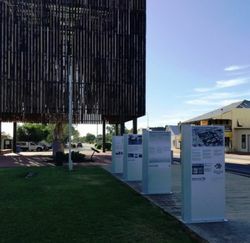 A monument commemorates the Heritage listed ghost gum which was maliciously poisoned in 2006. 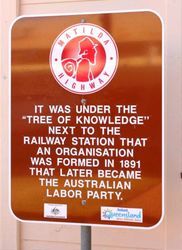 The tree was regarded as the birthplace of the Australian Labor Party and had links to the shearers strike in 1891. The architects, with vision and tenacity, have created a structure that commemorates, represents and respects the tree, inspiring visitors to consider the significance of this event and this place. In addition to the building memorial, the architects have cleverly enhanced the structure of the original tree, exposing the root ball below ground in a way that goes beyond preservation. 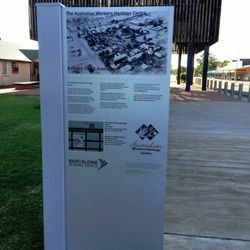 The 150-year old ghost gum, Eucalyptus Papuana, earned its claim to fame as the founding site of the political movement we now know as the Australian Labour Party. The party`s pioneers, disgruntled rural workers, first met under its boughs to plan their campaign for better pay and shorter working hours. Their push for reform resulted in the Great Shearers` Strike of 1891, a battle they eventually lost to the government-backed pastoralists. 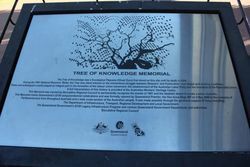 The symbol of the strike was the `Tree of Knowledge`, located in Oak Street in front of the railway station. Striking shearers held their meetings under this 150-year-old ghost gum. 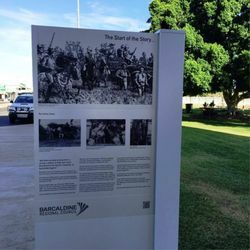 It was here that they sang Henry Lawson`s great poem `Freedom on the Wallaby` with its stirring final verse: "We`ll make the tyrants feel the sting Of those that they would throttle; They needn`t say the fault is ours If blood should stain the wattle."